From crossing the Oregon Trail in central Wyoming, to a half mile bore in an urban neighborhood, EBC Enterprises, Inc. understands your projects impact on it's surroundings. We successfully cross rivers and runways, canyons and passes, and wetlands and lakes. We understand the terrains and logistics of working in the plains, mountains, and deserts of the Mid-West and Western United States. In addition to our combined 60 years of experience in the industry, EBC Enterprises, Inc. utilizes the latest technology in drill head locating. 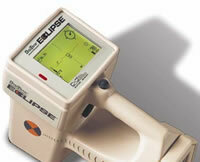 Our upgrade to the DigiTrack Eclipse locating system allows us to have the most precise data while using remote steering. This state-of-the-art technology gives us real-time data regarding the exact location of the drill head in the ground, as well as how that location relates to where the existing utilities run. All of this data is logged and later uploaded to our computer system to allow us to print detailed, user-friendly bore profiling reports. 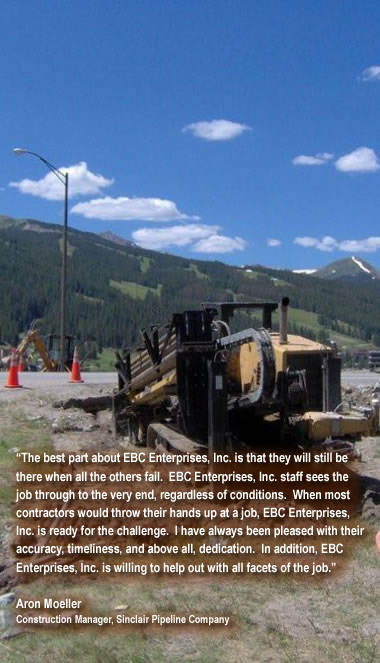 EBC Enterprises, Inc.'s equipment fleet and work force enable us to satisfy all of your pipeline construction needs. We have the resources to be your one stop shop! Our staff can assist you with any of your pipeline and trucking needs. We offer competitive pricing and service that surpass industry standards.